dsl – Java, SQL and jOOQ. The Java Fluent API Designer Crash Course. Anyone can implement an internal DSL in Java (or in most other host languages) according to the rules from that article. Of course, these overloads are available for any API method that accepts predicates / boolean values, not just for the HAVING clause. … and the overloads make conversion more conveniently implicit. The idea is that the WHERE keyword will never be commented out, regardless what predicate you want to temporarily remove. By (accidentally) adding a letter “s” to the equal() method – mostly because of IDE autocompletion – the whole predicate expression changes semantics drastically, from a jOOQ expression tree element that can be used to generate SQL to an “ordinary” boolean value (which always yields false, obviously). Prior to having added the last overload, this wasn’t a problem. The equals() method usage wouldn’t compile, as there was no applicable overload taking a Java boolean type. 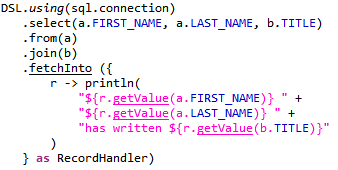 After jOOQ 3.7, this accident started to go unnoticed in user code as the compiler no longer complained, leading to wrong SQL. Java is “flawed” in that every type is guaranteed to inherit from java.lang.Object and with it, its methods: getClass(), clone(), finalize() equals(), hashCode(), toString(), notify(), notifyAll(), and wait(). In most APIs, this isn’t really that much of a problem. You don’t really need to re-use any of the above method names (please, don’t). But when designing an internal DSL, these Object method names (just like the language keywords) limit you in your design space. This is particularly obvious in the case of equal(s). We’ve learned, and we’ve deprecated and will remove the having(Boolean) overload, and all the similar overloads again.